To build a functioning traffic counter. For this purpose we will use an ultrasonic distance sensor. The recorded values ​​will be displayed on the Serial Monitor. The ultrasonic distance sensor uses sound to calculate the distance between the sensor itself and a given object. The sensor sends out a pulse and measures the time it takes to receive the echo of the pulse. The distance is calculated using the speed of the sound to the object and the measured time. 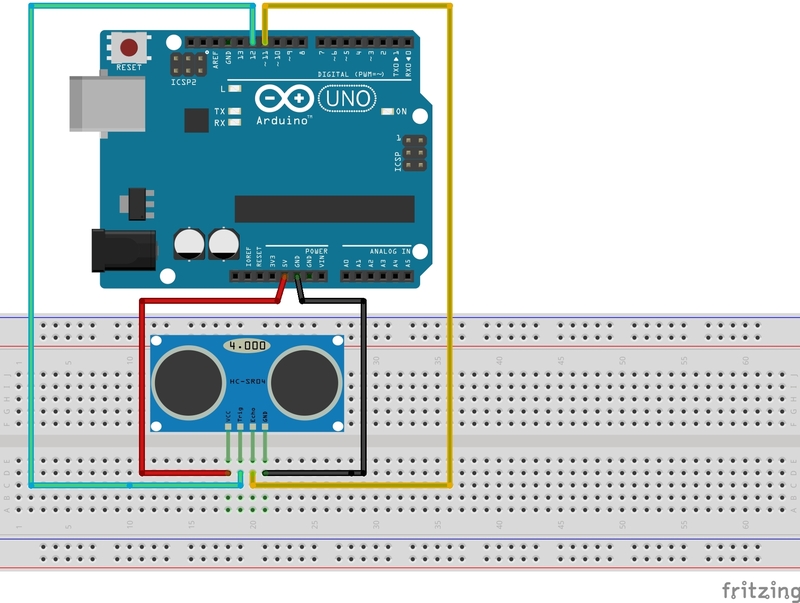 The ultrasonic sensor will be connected to four different ports on the Arduino. For the power supply, connect the VCC pin with the 5V port on the Arduino. To close the circuit, connect the GND pin to the GND port of the Arduino. Finally, connect the echo and the trigger pin of the sensor to two different Arduino digital ports (e.g. 12 and 11). Define the pins that are connected to the sensor as usual. In addition to that we need to define two variables to save the measured time and the calculated distance. In setup() we will start the Serial Monitor. We can then define which pins will represent the input and output. The sensor’s trigger pin must be defined as the output and the echo pin will therefore be defined as the input. The subsequent command time = pulseIn(echo, HIGH); saves the value for the time it takes to receive the echo into the variable time. Finally the distance to the car must be calculated. To do this we use the variable distance. The result we than display on the Serial Monitor. Try to build a traffic counter. Try to evaluate only a certain distance range, so that there isn’t any interference caused by movements in the background. The sensor measures up to approximately 3 meters. In order to avoid multiple counts of a stationary vehicle, you should program a condition that stops the counting process until the lane is free again. For this, you may use a while loop.